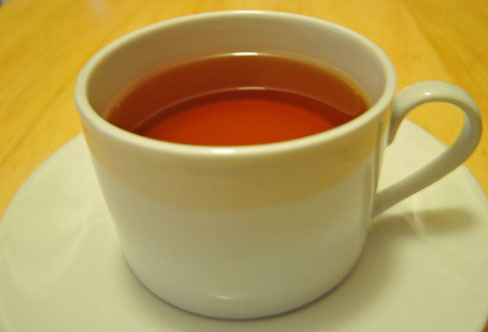 Earl Grey Tea was first marketed in Great Britain in the mid-1800s. Like the original British blends, Rishi Earl Grey tea is made from Chinese black teas. It is flavored with natural oils from bergamot orange. I love learning more about the tea I'm drinking! 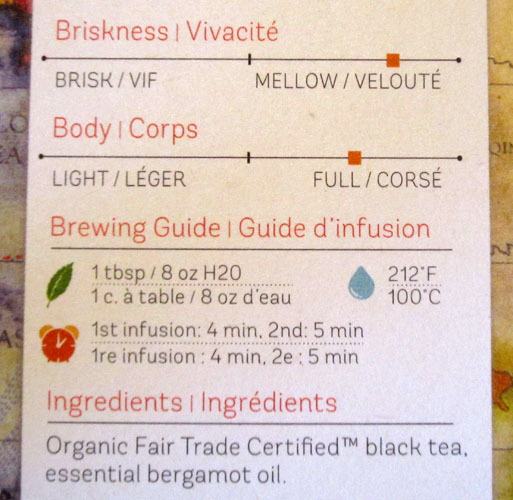 The detailed descriptions on the box tell me that Rishi Earl Grey contains essential bergamot oil, not artificial or synthetic flavoring like many Earl Greys use these days. The tea itself is organic and fair trade certified. I have a feeling Rishi makes a special effort to include only quality ingredients. Earl Greys are known for their citrusy flair. When I took in a whiff from the just-opened bag of tea leaves, I placed the scent as most similar to lemon. As a side note, bergamot orange is an extremely sour citrus fruit that grows in Southern Italy and has different characteristics from a traditional orange. Once brewed, I found the scent of the tea to be floral and sweet. The tea has quite a pleasing aroma if you ask me. The color is a rich orange-brown. Yunnan tea, from Southern China, is known as a smooth tea. The essence of bergamot orange (a fruit from Southern Italy) compliments it nicely to make a smooth, mellow cup of tea that is enjoyable any time of the day. It's black tea with a slight citrusy punch. This tea makes me think of the well-known Canal Street area in New York City, where there is a juncture between Chinatown and Little Italy and you can easily wander into either one. A little China and a little Italy in my cup of tea please! Do you know an Earl Grey tea lover? Rishi Earl Grey tea makes an excellent gift because the packaging is so exceptional! 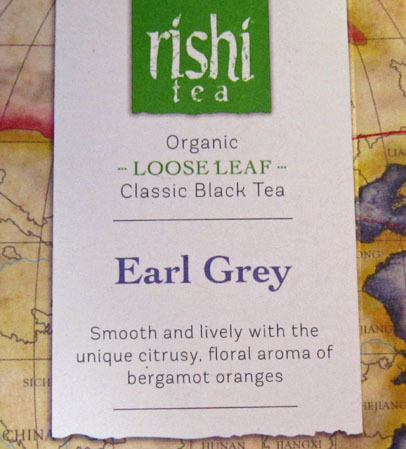 Have You Tried Rishi Earl Grey Tea?